After turbulent trading activity last week, gold and silver spot prices once again bounced off key lower support levels and have started the week on firmer footing. Silver buyers keep holding the line at $19/oz, a post-correction bottom that has held firm every time it was tested in the past year. Fed officials decided to trim another $10 billion from monthly bond purchases during last week's FOMC meeting. The overall amount of remaining QE stimulus now stands at $45 billion in new asset purchases monthly using newly printed dollars. The latest reduction in monthly stimulus added to investor expectations that Janet Yellen's Fed will wind down QE entirely and perhaps eventually even normalize interest rates. The immediate response following the news was mildly negative for gold and silver. Friday morning's employment report generated even more selling. The number of new jobs surpassed expectations, and the headline unemployment rate fell a whopping 0.4% -- from 6.7 to 6.3%. The news reinforced the notion that the U.S. economy may have built enough steam to survive without Fed stimulus. By Friday afternoon, however, investors reversed course and started buying the precious metals -- a deeper look at the employment report had revealed a major flaw in the economic recovery thesis. Meanwhile, violence surged in Ukraine. These fundamental realities, combined with strong chart support, drove a significant intraday rally. By the weekly market closing, silver had jumped more $0.80/oz from its lows and gold nearly $20/oz. The U.S. Bureau of Labor Statistics (BLS) treated investors to their latest Employment Situation report on Friday. Officials claim the U.S. added 288,000 jobs, which beat the 220,000 consensus estimate. The most-favored measure of unemployment fell to 6.3%. Traders and computer algorithms scanned for these highlights and reacted by buying stocks and selling gold. 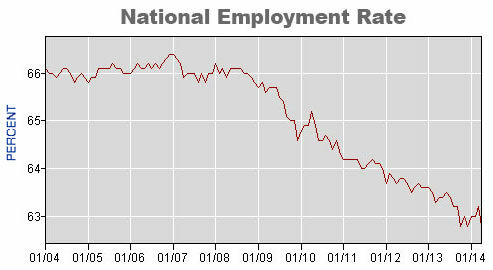 In fact, these reports have generally shown the unemployment rate falling since 2010. The focus on this unemployment rate is pervasive. Politicians and commentators love to point at the above chart when talking about recovery. Hooray for recovery, and three cheers for strong dollar policy at the Fed? Stock prices sit at record highs and metal prices rest near 3-year lows. Safe haven investors can certainly attest: holding onto a conviction that major unsolved structural problems persist in the U.S. economy hasn't been a losing bet recently. The problem is that political appointees at the BLS tailor the headline numbers to obscure the terrible truth about employment in the U.S.
Making investment decisions based on the false notion of economic recovery and falling unemployment will ultimately end in pain. At some point, markets are going to reflect the awful reality buried deep in the BLS report. Last week the percentage of people who have a job fell back to its 35-year low -- 62.8%. Take out the phony “seasonal adjustments” and the arbitrary removal of long-term unemployed from the BLS calculation of the unemployment rate and you get the real picture of what's happening on the employment front. It's the same downward sloping chart, but this time it isn't good news. 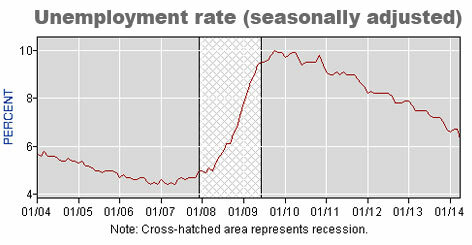 So we have overall employment falling dramatically at the same time the official unemployment figure is falling! The reason is government removes millions of chronically jobless persons from unemployment data. Adding to the misery is the reality that real wages and the quality of new jobs have been steadily falling for decades. Government statistics suffer a blow to credibility with each new report. In fact, Fed officials intentionally de-linked stimulus withdrawal from a specific unemployment rate trigger last week. (Ben Bernanke had committed to continuing stimulus until unemployment fell to 6.5% or below.) They apparently realize that the government's unemployment rate paints way too rosy a picture and don't want limits on inflationary measures they may wish to take. Investors will continue to watch events in Ukraine closely. Signs of significant escalation in the conflict, which is already dangerously close to declared war, are likely to drive safe-haven asset buying. The week will be quiet in terms of scheduled events and data on the U.S. economy. Tuesday, May 6th – International Trade. The trade deficit is expected to be near $40 billion for March -- close to the average of the past 5 years. The U.S. has run trade deficits for decades, but many question exactly how long we can continue borrowing to buy more in goods and services than we sell. 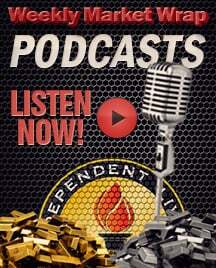 Wednesday, May 7th – Janet Yellen Speaks. Investors will watch closely for clues about the timing of interest rate increases. Fed officials have recently downplayed the notion of raising rates any time soon.